Podcasting shows explosive year-over-year growth as gains in spoken-word audio mark the 2019 Infinite Dial Study by Edison Research and Triton Digital®. Among the U.S. population ages 12 and older, the total number of people who have ever listened to a podcast passes 50% for the first time. “This is a watershed moment for podcasting–a true milestone. With over half of Americans 12+ saying that they have ever listened to a podcast, the medium has firmly crossed into the mainstream,” noted Tom Webster, Senior Vice President at Edison Research. “It’s a pleasure to once again partner with Edison Research for another insightful presentation of media usage and consumption in the U.S.” said John Rosso, President of Market Development at Triton Digital. Regarding social media, the latest study finds the number of current users of Facebook continues to drop. The study shows an estimated 15 million fewer users of Facebook than in the 2017 report. The declines are heavily concentrated among younger people. –More than half the U.S. population now reports having used YouTube specifically for music in last week. This number is now 70% among 12-34-year-olds. –The percentage of Americans who listen to online audio (defined as listening to AM/FM radio stations online and/or listening to streamed audio content available only on the internet) has doubled since 2012, growing from one-third of the population to two-thirds. –Time spent listening to online audio has reached a record high this year, with weekly online audio listeners reporting an average of nearly 17 hours of listening in the last week. The 2019 Infinite Dial is the latest report in a series dating back to 1998 that covers consumer usage of media and technology, has tracked many new mediums as they develop. The Infinite Dial currently provides the latest research in U.S. digital audio, mobile, smart speakers, podcast consumption, and social media. The Infinite Dial study uses the “gold standard” of nationally representative survey research—a random probability telephone sample, comprising both mobile phones and landlines, of all Americans ages 12 and older. The study has become the report card on digital audio and other digital media and is widely used and quoted by broadcasters, Internet radio, ad agencies, and the financial community. Please visit the links below to download the entire study and to watch a recording of the online presentation. View the recording of The Infinite Dial 2019 presentation here. A total of 1,500 persons were interviewed to explore Americans’ use of digital platforms and new media. From January 3rd through February 4th, 2019, telephone interviews were conducted with respondents age 12 and older who were selected via Random Digit Dial (RDD) sampling through both landline phones and mobile phones. The survey was offered in both Spanish and English. Data was weighted to national 12+ U.S. population estimates. As Edison Research’s Share of Ear® studies have consistently shown, when people are in their cars, it is AM/FM Radio that is the overwhelmingly dominant audio companion – -with 67% of all listening going to broadcast radio. No matter the age of the car one is driving, this is the case. 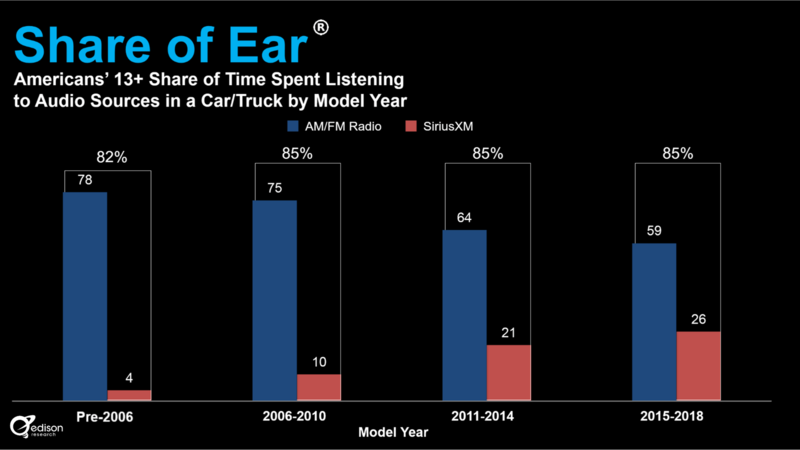 AM/FM garners a strong majority of all time spent listening in the car, even among people who drive the newest cars. However, one can’t help but see that among those who drive the newest cars, listening to AM/FM is not quite as robust as it is among people who drive older cars. When people have more choices, some people will, obviously, avail themselves of these new options. And the choice that people driving newer cars seem to be making in greater numbers is SiriusXM. As the graph below shows, among people whose principal car is model years 2015-2018 more than one-quarter of listening in the car goes to SiriusXM. What is fascinating is if one adds together the AM/FM number and the SiriusXM number, as is shown in the graph below. In every case, the sum of the two numbers is essentially the same. No matter the age of the car – about seven-eighths of all listening goes to “Radio” – whether it is delivered from a satellite dish or a ‘terrestrial’ tower. For all the discussion of new technologies in the car, such as voice activation, podcasts, and streaming, for most people and drivers of most cars, their time spent behind the wheel is taken with linear, programmed, hosted ‘radio’ type content. For more on in-car listening, download the complete Miles Different: In-Car Audio study here. Edison Research conducts a nationally representative study of Americans ages 13 and older to measure their time spent listening to audio sources. Respondents complete a 24-hour diary of their audio listening on an assigned day. Diaries are completed both online and by-mail using a paper diary. Diaries were completed in both English and Spanish.